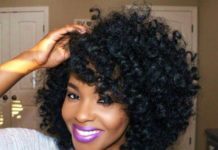 Whether you’ve got natural black hair or you choose to add the shade artificially, there’s no denying the sleek elegance of jet black locks. When it comes to playing with multi-tonal hair colour, black is an amazing compliment to any other shade, but naturally black hair of course requires the most chemical lightening. 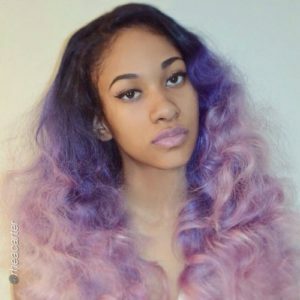 It may take you longer to be able to add ombre to your black hair, but the edgy finished product will make the time and effort worth it. 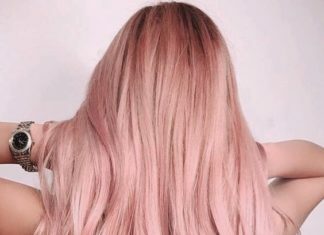 For women with lighter hair colours, creating black ombre ends is a cinch, and most amateur at-home stylists should be able to add dark ends to their style in the comfort of their own home. 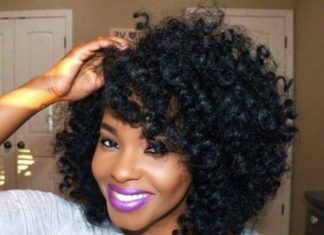 If you’re considering lightening your black hair, or adding ebony ends to your look, take a look at 20 of our favourite black ombre hairstyles. This long, naturally black hair turns to a smoky grey shade at the ends, making it silvery enough to be on-trend, but more subtle than a white shade that can be difficult to achieve and keep, especially on naturally dark hair. 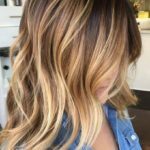 Using some darker caramel shades to help transition between black roots and blonde ends, this ombre style steers clear of harsh lines where one colour ends and another begins. 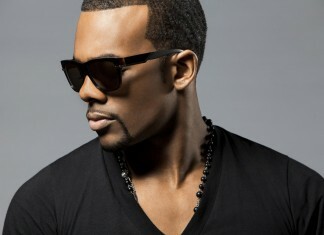 This rich blend of dark and light is the perfect style choice for warming up your look during fall and winter months. With a blue grey ombre that begins around chin level, this mid length blunt cut gets added visual detail without sacrificing any hair, making it the perfect choice for fine haired women who want to avoid adding dramatic layers or bangs to their style. 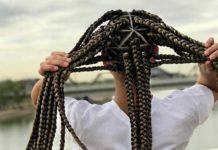 Stepping out with a bold style that treats hair colour like an art project, Drew Barrymore’s dip dye black ends are the perfect accompaniment to her blunt blonde bob. 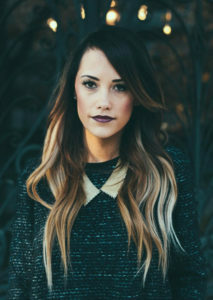 Not only is this look fairly easy to replicate on your own, but the small amount of black makes it easy to lose the ombre ends with a quick trim. 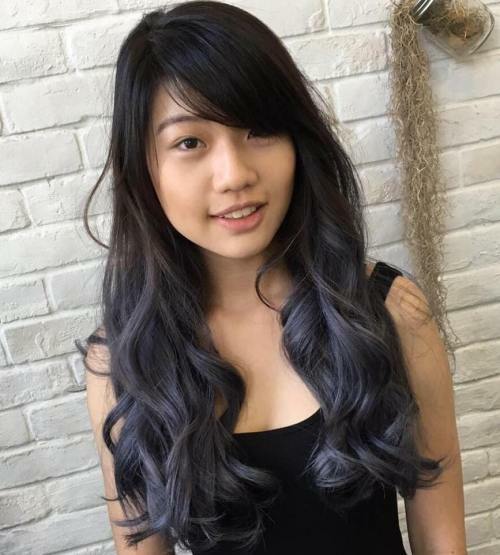 This silver ombre starts high up enough that most of the hair is a steely colour, and only a few inches of black root are exposed at the top. 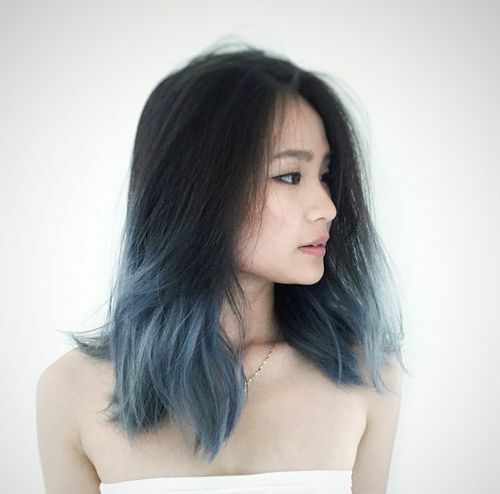 Although silver is a bold colour choice, it pairs well with almost any shade of lipstick or outfit. This ultra sleek blunt bob balances black roots and pink lengths, for a style that mixes superhero style with fashionista flair. 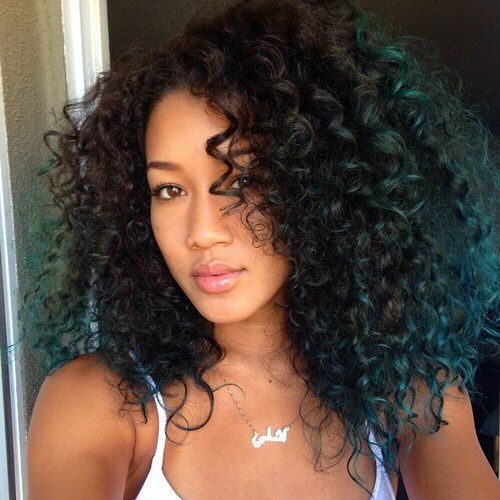 For natural curls with a little dose of mermaid colour, this ombre style adds an aqua shade that’s concentrated on hair’s top layer. When adding dimensional colour to naturally curly hair, it’s a good idea to see a professional stylist who understands where to add colour to compliment your specific curl pattern. Unlike the typical colour palette that sees blonde ends on natural brunette hair, this hairstyle features black ends for a dark and stormy look that you won’t see everyone else wearing. 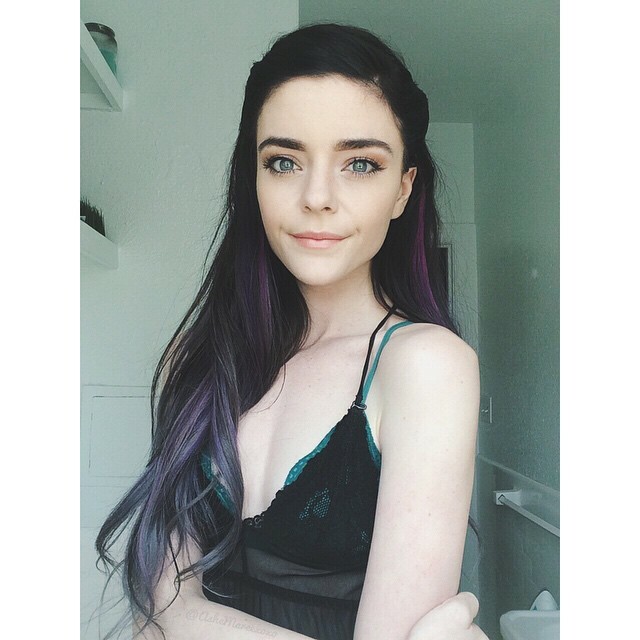 These long, gorgeous raven locks get a subtle colour bump with rich amethyst and blended smoky purple shades. 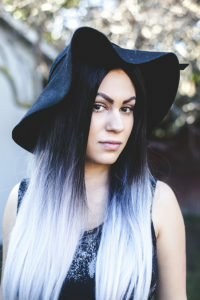 Creating the starkest possible contrast, this hairstyle is half jet black and half silvery white. This stunning style is bold and unique, but it can be damaging to turn hair from darkest black to brightest white, and should be attempted with the guidance of an experienced colourist. 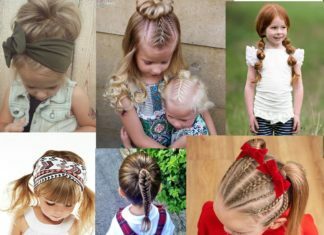 An enduring symbol of edgy style, Gwen Stefani’s dip dyed long bangs bring an added edge to her signature platinum locks. 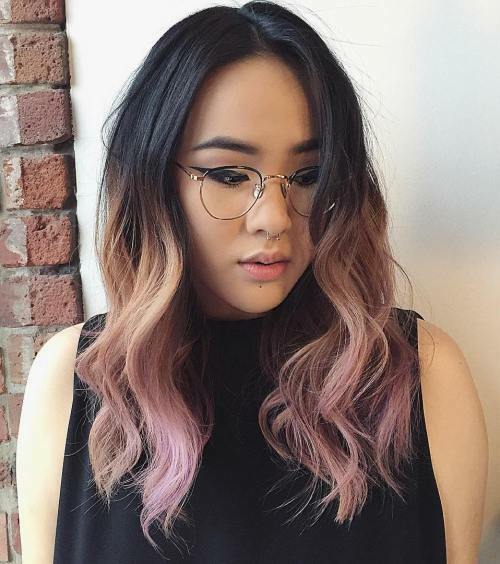 This pastel ombre on natural black hair is a great example of how vibrant temporary colours can look stylish even as they wash and fade out of hair. Another example of an ombre style that inverts the popular look of light ends and dark roots, this mixture of platinum blonde and dark espresso has a high fashion quality that pairs well with runway inspired clothing choices. 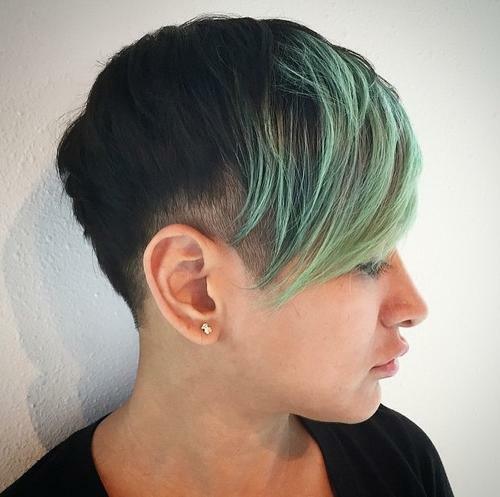 Although pixie cuts don’t usually get in on the ombre action, this short black cut has light aqua bangs that prove mermaid style isn’t only for women with long hair. 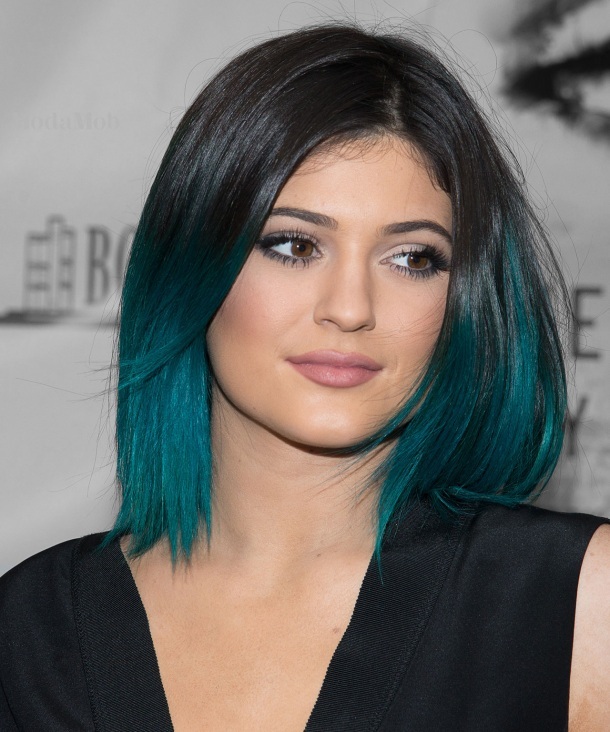 An example of how celebrities influence style and beauty trends, Kylie Jenner’s teal on black ombre inspired many women to adopt the style. 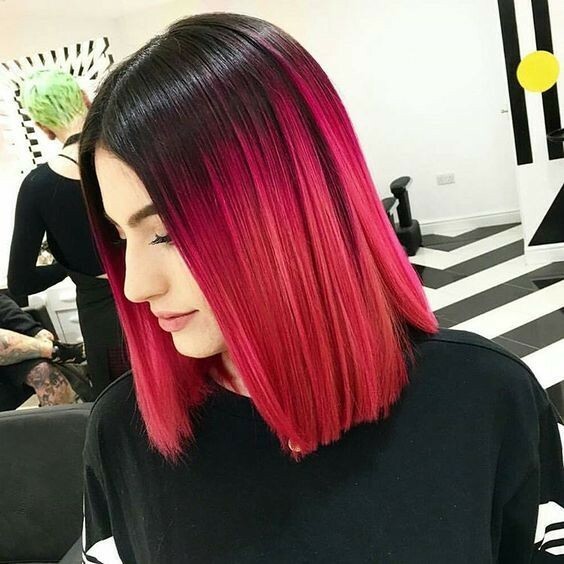 This cut and colour together are a perfect example of how vibrant, trendy ombre and sophisticated mid length cuts can perfectly compliment one another. One of the more natural looks on our list, Ashlee Simpson’s ebony hair gets warmed up thanks to a richly layered caramel ombre tone. 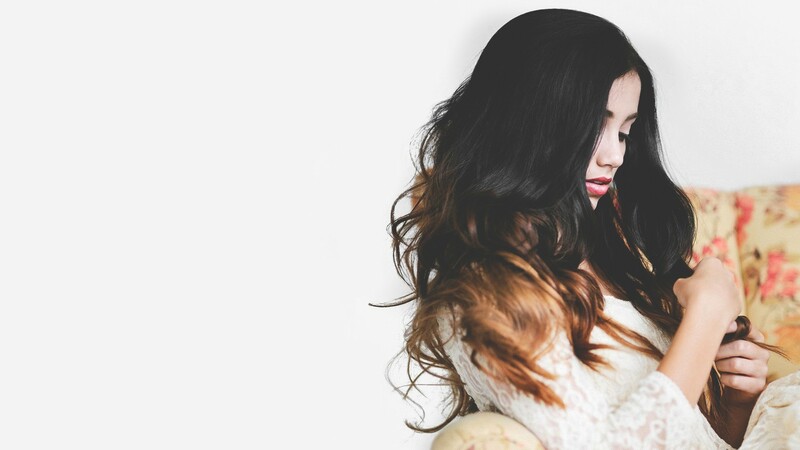 This is a perfect way to reinvigorate your dark hair without going for a complete colour overhaul. For the ultimate in fantasy inspired hair, this style layers purple and pink in pastel candy shades over dark hair full of natural curls. 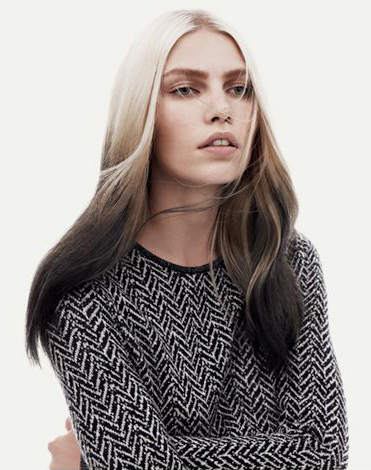 Bleached blonde ends on long black hair make for an edgy style that’s far from subtle. 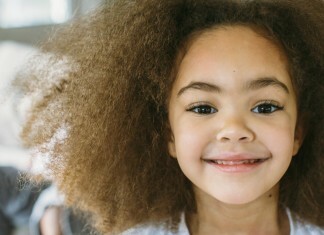 Because the chemical lightening process opens hair’s cuticle, it can make strands feel thicker, but also dried out and potentially damaged. While vibrant shades have been a popular trend for the last few years, true green is a shade that’s been mostly left alone. 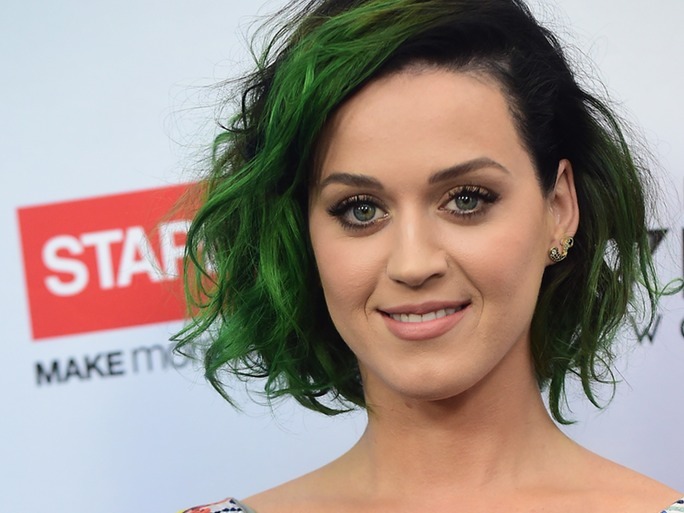 Leave it to Katy Perry, queen of bold hair colours, to wear it flawlessly. 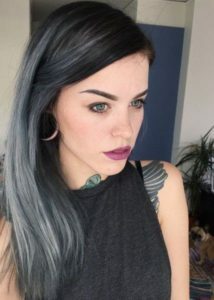 Not only does this shade bring out her steely eyes, but it pairs perfectly with black roots to create a bold but earthy palette. Adding some raw edge and dimension to long platinum hair, these black ends are a great choice if you’re trying to balance out darker roots, or slowly transition to a darker shade overall.